NASA has successfully moved one of its Mars-orbiting spacecraft into a new position to provide prompt confirmation of the upcoming Aug. 5 landing of the new Curiosity rover on the Red Planet. The 11-year-old Mars Odyssey probe performed a six-second thruster burn Tuesday (July 24) that nudged it six minutes ahead in its orbit, NASA officials said. The manuever placed Odyssey in a prime spot to receive signals from the Curiosity rover when it streaks toward the Martian surface, and to relay news of the rover's landing back to Earth. 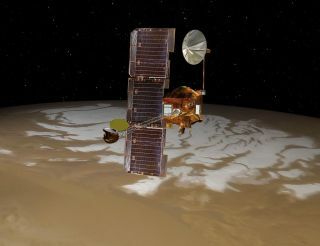 "Information we are receiving indicates the maneuver has completed as planned," Mars Odyssey project manager Gaylon McSmith, of NASA's Jet Propulsion Laboratory in Pasadena, Calif., said in a statement. "Odyssey has been working at Mars longer than any other spacecraft, so it is appropriate that it has a special role in supporting the newest arrival." The move marks something of a comeback for Odyssey, which in early June suffered a malfunction on one of its reaction wheels, instruments that help control the probe's orientation in space. The glitch caused Odyssey to go into a precautionary safe mode on July 11, which in turn affected its orbit. As a result, officials weren't sure whether Odyssey would be in the right spot during the 1-ton Curiosity rover's touchdown. Without the corrective engine burn, Odyssey would have arrived over Curiosity's landing site — the enormous Gale Crater — about two minutes after the rover touched down, officials said. Curiosity, the centerpiece of NASA's $2.5 billion Mars Science Laboratory (MSL) mission, will investigate whether the Gale area is, or ever was, capable of supporting microbial life. Odyssey is uniquely capable of relaying the landing news in real time. Two other Mars orbiters, NASA's Mars Reconnaissance Orbiter and the European Space Agency's Mars Express, will receive transmissions from Curiosity's spacecraft, but they'll send the communications along to Earth after a delay of several hours, officials said. And Earth will set below the Martian horizon before Curiosity touches down, meaning the MSL spacecraft won't be able to beam signals home directly. The upshot of Odyssey's successful maneuver is that the Curiosity team should learn of the landing's outcome by 10:31 p.m. Pacific time Aug. 5 (1:31 a.m. Eastern time Aug. 6). Odyssey began science operations in February 2002, and it has now worked at Mars longer than any other mission in history. The probe created the first global maps of chemical and mineral distribution on Mars, and its observations led to the discovery of vast amounts of water ice buried under the planet's surface. The spacecraft has also served as a communications relay station for NASA's Spirit and Opportunity rovers and the Phoenix lander.